Stretching from the Murray Canal in the west to the City of Brockville Ontario in the east, the Bay of Quinte and 1000 Islands offers boaters a wide range of possibilities. Whether your preference is a secluded anchorage away from the crowds, a night on the town within walking distance of your boat, or being one with nature in a national park, this Eastern Lake Ontario and St. Lawrence River cruising area has what you are looking for. 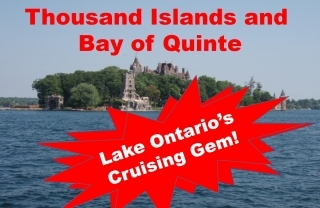 On Wednesday, March 27, at 8:00 pm Eastern/7:00 pm Central, GLCC Rear Commodore Eric Sunstrum will take us to this enchanting destination in Cruising Guide to Lake Ontario's Bay of Quinte and 1000 Islands. Click here for more information and to register for class.